Registration is now open for my spring baking classes, offered through the St. Charles Parish Schools Community Education* program. Learn to bake yeast breads from scratch, or learn to craft a high-hydration, no-knead, wild-yeast sourdough loaf. Baking with Yeast: Bread Baking for Beginners is a three-session, hands-on adventure. Learn to measure, mix, knead, and shape yeast breads, including a tender whole-grain sandwich loaf, buttery soft pretzels, filled breads, and more. The supply fee covers essential, reusable materials like a dough shaper, rising bucket, loaf pan, as well as bread ingredients used in class. Sourdough Bread at Home: Crusty, Wild Yeast Loaves is a one-session, jam-packed class devoted to non-kneaded, high-hydration, wild yeast bread, baked inside a Dutch oven. 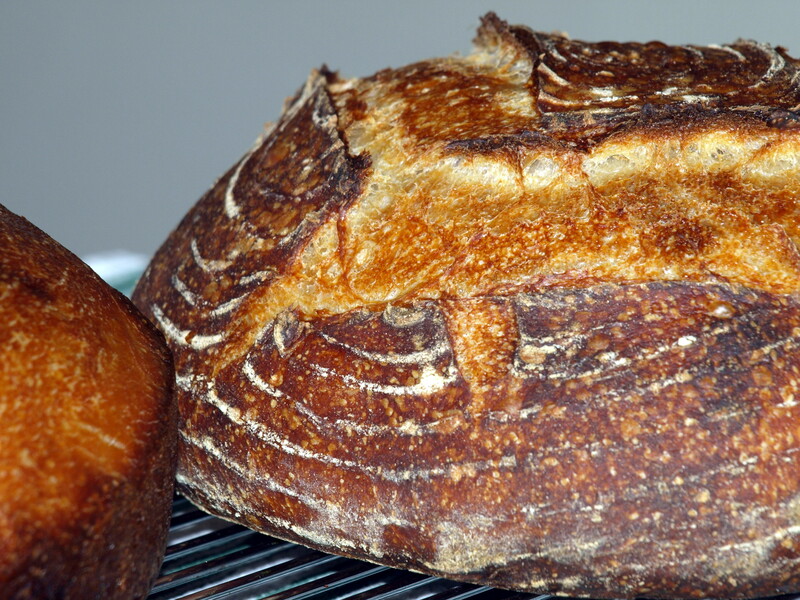 Learn to cultivate a wild-yeast (aka sourdough) starter and to work with wet dough in order to create amazing, artisan-bakery quality rustic loaves (exactly like the one pictured above) in an ordinary home oven. A sample loaf will be baked in class; students will receive an active sourdough starter and mix dough in class to be baked at home the next day. Sign up by February 13, 2012, and receive a 5% early registration discount (senior citizens receive a 10% discount). Registration forms are available online here. *You do not need to be a St. Charles Parish resident to enroll in a Community Education course; classes are open to the general public. Love your blog! Thanks to your mention of the KAF demos, I was also there last weekend…thought Frank was great. I bake bread regularly and feel that I’m ready for the next step…I’m looking for a participatory class where my baking can be refined. Is your class for beginners only? Do you or will you have something for bakers with some experience? The class is hands-on, so every participant has the opportunity to work to his/her own level and ask lots of questions. The fall class included novice and more experienced bakers. Each week features two different breads, so participants have supervised, hands-on experience with six different doughs (sweet and savory) by the end of the class. On the other hand, the sourdough class focuses on high-hydration (ie, wet dough), rustic peasant loaves, made with young levain. It’s a different style of baking, with a flexible time schedule and distinctive end product. If you’re looking for something different, it might be the ticket.